Update: the Moment Lens article we wrote from this experience is up! I don’t love visiting places two (or three) times, but White Sands National Monument is a different story. This is actually our THRID visit to White Sands. While there are a couple really good options for boondocking in the area, sometimes it’s nice to have a good shower and not worry about where to get water next. We were able to snag in a first-come-first-serve spot with electric hookup at Oliver Lee Memorial State Park which is actually the same place we stayed when we first visited White Sands back in 2016. The first time we came to White Sands the kids were so little! The second time we came here, we were celebrating our 2nd Nomadiversary. Sometimes its fun to look back at how much they’ve changed. I can’t believe we’re coming up on our 3rd nomadic year soon. Sometimes it feels like we’re just getting started. During our second visit to WSNM, we wanted to tent camp. I called to see if they had any permits left for the backcountry camping but they weren’t giving any out that night because of severe wind warnings. I can imagine it wouldn’t be pleasant to be tent camping in a wind storm while near sand dunes. This time, however, the weather looked promising and I was able to obtain a backcountry pass! We were so excited. The kids and I got all our gear together (which is quite a bit with 6 people). We were able to squeeze most everything into our 3 backpacks. Thankfully, I scored site #10 which is only .6 miles from the trailhead. The kids were so excited to be tent camping again. The last time was in Ajo which was much warmer! We finally made it to our site! Jonathan and I quickly set up our Winterial tents while the kids enjoyed sledding down the dunes nearby. This trip was actually two-fold. While we’ve always wanted to camp out here, we were on a mission. We just received some Moment Lenses for our new iPhones and were writing an article for them about photography at White Sands. What better way to capture this place than at sunset and sunrise?! If you haven't hiked out away from the crowds at White Sands, you're missing out! There is something so special about this place, especially when you take time to get out there, alone on a dune. We all had so much fun sledding as the sun was setting. The night before was a full moon so we knew we were in for a treat once the moon showed up. Jonathan got some great pictures at sunset. It's really hard not to get good pictures in a place as beautiful as this. We were quickly reminded how cold the gypsum sand gets once the sun disappears. Everyone ran back to put socks on to extend the fun as long as possible. I have to admit, it was pretty fun running around in our socks. Fun, but COLD. By 7:00 everyone was so cold so we brushed as much sand off as possible and got in our tents in attempt to keep warm. It was so dark even at 7:30 as the moon had yet to make his grand appearance. Come 9:00 Jonathan ventured out to get some moonlight shots with the lenses. I wasn't about to get out of my sleeping bag at that point. He said the moonlit dunes were indeed magical, but I dozed off. Around 10pm I woke up and realized - this is going to be a VERY LONG NIGHT. I was completely zipped up inside my sleeping bag (with my down jacket still on) with the top cinched up as much as possible with only a small hole where I tilted my nose out to breath. STILL FREEZING!! I was never able to get my feet warm. I kept going in and out of sleep and I’d wake up to check the time, and by midnight I was so scared that the kids were going to freeze. I wanted to check on them, but I couldn’t move. I knew with 4 of them in that small of a tent (and their better rated gear) they were warmer than we were. I know what you're thinking at this point. Yes, we checked the weather before we went, it was only supposed to get down to 36 which we figured, we can do that. Our bags were rated for 30 degrees, but turns out, that it’s not recommended even if it’s rated that low? What??? Anyway, we powered through and woke to a thin layer of ice on everything we left outside. Our shoes even had a nice layer of ice on them. Lesson learned: shoes go in the tent! As soon as we could, Jonathan and I climbed to the top of the dunes in search of that warmth that the new day brings. He went off to grab some sunrise pictures and I stood in the light trying to thaw. He said a bunch of his pictures weren't even usable because he was shivering and making them blurry - HAH! Once the sun reached the tenting area and the kids reluctantly got out of bed. We packed up as quickly as possible and started the hike back. On the way back home we joked around about how miserable we all were. "Remember that time we made everyone sleep outside in freezing temperatures?" At least we were able to laugh about it. I know, I took it the worst. As soon as we got home, I took the girls to the showers and we all got cleaned up and I went right to sleep. I SLEPT ALL DAY. I felt horrible. My whole body ached from shivering all night. It wasn't until the next morning that I felt like a human again. Now we can joke about the experience, but we have all agreed to leave our tenting gear in Knoxville this summer. It will be awhile before I agree to another tent camping adventure. Despite the cold temperatures, we were able to get some pretty great pictures. We made a fun memory with the kids that I’m sure they’ll never forget, and we have learned that backpacking probably isn’t for us! At least maybe until we get better gear. Every experience, good or bad, is teaching us more about ourselves and if we don’t like tent camping, that’s okay! 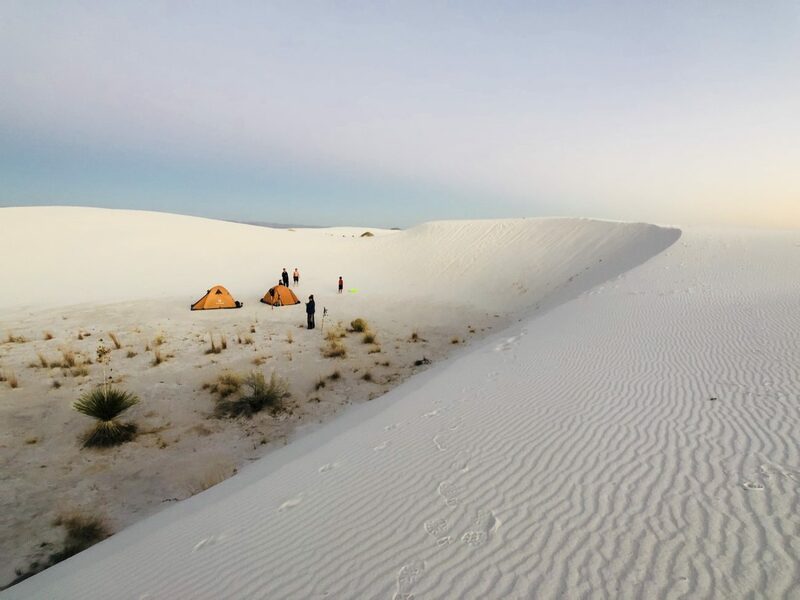 Would we recommend tent camping at White Sands National Monument? Absolutely! But only if you have the proper gear! Want to see more pictures? Check out the article at Moment!